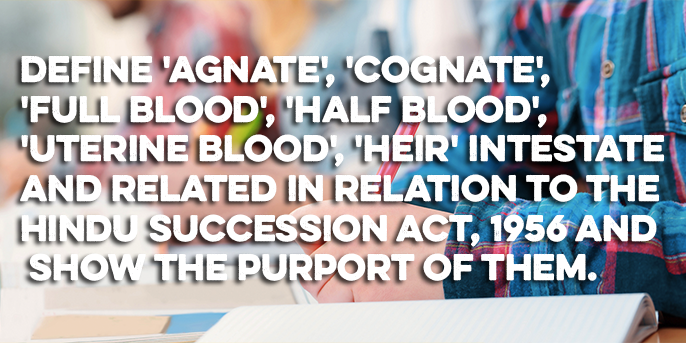 Define ‘agnate’, ‘cognate’, ‘full blood’, ‘half blood’, ‘uterine blood’, ‘heir’ intestate and related in relation to the Hindu Succession Act, 1956 and show the purport of them. Ans. Agnate.— One person is said to be an ‘agnate’ of another if the two are related either by blood or adoption or wholly through males. [Section 3 (I) (a) of Hindu Succession Act]. The agnatic relation may be male or female. It must be remembered that the relationship referred to here is relationship by blood and not by marriage. Thus the ascendants and descendants of a Hindu in the male line of succession or those who come in the family by adoption through males are agnates. Thus one’s father, grandfather, etc., in the ascending line; uncle’s son etc., in the collateral line or son, grandson in the descending line are agnates. 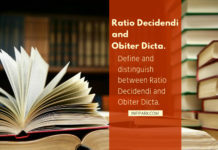 (3) Where neither heir is entitled to be preferred to the other under Rule 1 or Rule 2, they shall take simultaneously. Full blood [Section 3 (1) (e) of Hindu Succession Act].—Two persons are said to be related to each others by full blood when they have descended from a common ancestor by the same wife, e.g., full brother, full sister, full paternal uncle, etc. Heir means any person male or a female who is entitled to succeed to the property of an intestate under the Act. Heirs contrary to a reversionary who has only a chance of succession limit the relations of a person dying intestate to only those of them who have been given the right to inherit and all other relations are excluded from the category of heirs. 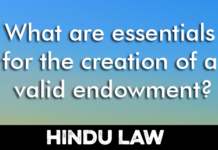 Intestate [Section 3 (1) (g) of Hindu Succession Act].—A person is said to die intestate in respect of property of which he or she has not made a testamentary disposition capable of taking effect. A person may dispose of his property by testamentary disposition. The property then devolves according to the terms of the will. There may be a will which is executed by the deceased for an illegal purpose not capable of taking effect. So the will must be an operative will, and if the will is void and incapable of taking effect, it will be deemed that the testator has died intestate. Related [Section 3 (1) (j) Hindu Succession Act].— ‘Related’ means by legitimate kinship. Kinship is created by blood or by adoption. 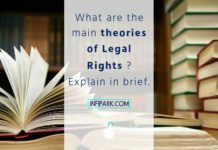 Legitimacy depends upon marriage laws and is to be determined accordingly. There is proviso to this definition. Illegitimate children shall be deemed to be related to their mother and to one another and their legitimate descendants shall be deemed to be related to them and to another and any words expressing relationship shall be construed accordingly. So according to this definition in no case an illegitimate child shall be recognised as an heir to his father. The mother will, however, be treated as a stalk of descent and establishing relationship between her and her issue. As regards descendants only the legitimate issue of her own issues shall be deemed to be related to the mother and to her legitimate children. This is to say the relationship is made legitimate only for one generation. Illegitimate children of subsequent generation lose their relationship to the ancestress. But they will be considered as properly related to their mother, brother or sisters. 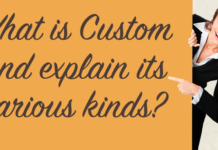 Previous articleWhat is Custom and explain its various kinds? 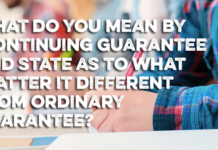 Next articleWhat do you mean by continuing guarantee and state as to what matter it different from ordinary guarantee?